The “(not)small, (definitely not)simple, A-frame(McMansion)” edition. Let me tell you something, Oppo. if all your major competitors are refusing to do what sounds like a very simple job for a very friendly sounding young woman, warning bells should be going off in your head. There is always a reason. But it’s been a long week spent under the heel of a nasty cold so I didn’t think much of it and scheduled the home for Wednesday. When she called at 9pm—the night before—saying she’d be sure to leave a large tip, I started to feel... Uneasy. After downing a handful of pills I hope was cold medicine, sleep finally came. The next day started out fine with a decent sized custom home on the water. Four hour job for myself and one of my guys. After that, we hopped in the Ranger and headed to the mystery house. After five minutes driving along the private road to her home—because nothing screams “small home” like a private, gated driveway—we saw the house. We saw the A frame. We saw the second, larger A frame that had been built around the original. We saw the more recent addition of a large, western facing wing, three stories high. We saw the questionable design choices that would make even getting to the windows a major challenge. We saw a row of skylights set in a metal roof much too steep to walk on. Those were a good 30 feet—roughly 500 meters for you non-American folk—off the ground. And so we turned around, went home, grabbed a bottle of bourbon and proceeded to drink until the memories became indistinct. Err, wait. No. That’s what we WANTED to do. Here’s how it actually went down. The home looming over us, I pulled up, killed the engine, footed the parking brake and exited the vehicle with all the grace and vigor of a senior citizen impeding shoppers in a crowded grocery store. Me, sicker than a dog. My partner, still limping from the rotten deck he fell through the week prior (that’s a story for another day). Next job? Scheduled at three sharp. 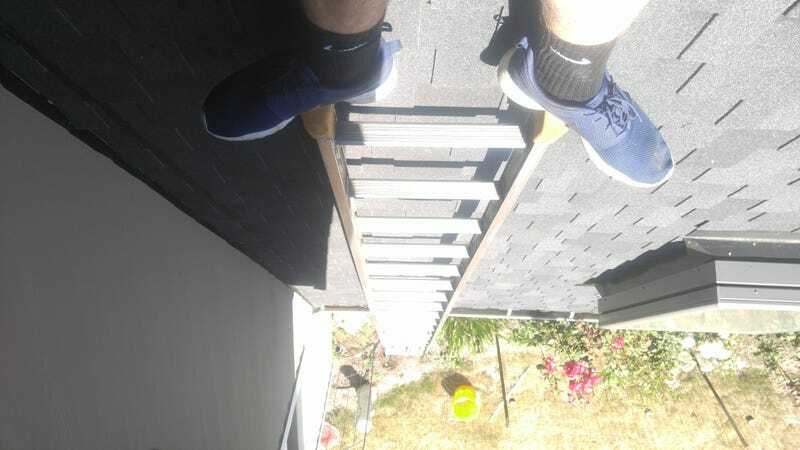 We started outside, myself on ladders, my partner fighting his way through endless rose bushes to get the bottom floor windows beneath the A Frame eaves. The only ray of light on this dark, dark day (80° and sunny) was this gentle doggo who followed me without making a peep. Here’s a better picture so you can see the actual window section. Fun stuff. But nothing too crazy. After getting the section above, it was skylight time. There were 20 on one side, and two on the side I was already on. I started with the easy side as a warmup. Same deal, big ladder set up at a non-OSHA approved angle, but now with extra razorblade work! If you have a good eye you’ll be able to make out my partner being torn to bits getting the windows below me... Poor chap. He was literally crawling on hands and knees to try avoiding thethorns. After those, we tag-teamed the remaining 20 skylights, two stories higher on a similar slant. It’s painful how quickly I wrote that sentence, when it was easily two hours of work. I counted 12 sliding doors to nothing. These are one of my most hated design elements and if you have this setup, please for the love of God tell me why. Okay. Deep breaths. We’re good. Onto the inside! A surprising blend of old school log cabin meets modern big city styling. Not only does this home have both wood and metal railing, the metal rails are all tubular connected rails on one side, and squared off non-connected pieces on the other. I can only assume the contractors were trying to save money by using whatever scrap the had lying around. Oh and the welding itself is just atrocious. Look at this. No blending whatsoever, they didn’t even go over everything. It’s literally just a tiny bead at the bottom of every tube, where it meets the main supports. Here it is from above, courtesy of my employee’s Snapchat story. Can you tell how much I dislike this railing? I’ve got a good friend who does incredible metalwork in homes and businesses so seeing something so shoddily put together like this is hard. Back to the windows. Open up the back door, walk in, turn around and look up. This is what you see. Big ladder inside, plus some pole work from two stories up on a ledge took care of this. Here’s the view from the top. We ended up finished the place at six, three hours after we were supposed to arrive at our final house. The last house was super simple, took under an hour, so we went back to base and parted ways. I arrived home, shotgun’d a cold remedy and started typing away at this story you’re reading. Writing helps make the tough days seem a lot more bearable. Strange but true. I’ll leave a few more photos of the house. It was a pretty interesting place, when viewed through the eyes of someone who doesn’t have to work there. Built in the 40's, one major addition in the 80's and then another just a few years ago. I look forward to sending my guys out to do it without me in the future.